Naas faced Old Belvedere last Saturday afternoon, and despite a fine and much improved performance defeat was to be their lot. This game was played in dreadful conditions, the attendance suffered as a result, but those who did brave the elements could not fault the efforts of the players on both sides. The visitors played with the strong breeze at their backs and made a very positive start. After only three minutes the Naas scrum were penalised for wheeling, and out-half and captain Steve Crosbie made no mistake with his penalty attempt. Naas then gifted Belvedere a try. It came after 13 minutes when they attempted to run a ball from their own goal line. In these conditions this was a strange decision and they were punished fully. A wild pass to nobody in particular went right behind the Naas backs, and the Belevdere centre Tom Molony only had to pick up the ball to stroll in for the score. Crosbie added the conversion and Naas were ten points down. It could have got worse as Crosbie missed two further chances to extend the lead, but to their credit Naas began to gain a foothold in the game. They started to dominate the possession and they were rewarded on the stroke of half-time with a fine score. 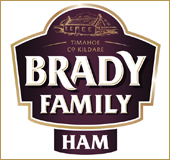 A series of drives by the Naas pack put the visitors defence under pressure, and finally led to scrum-half Richard Fahy picking up from the base of a ruck and crashing over to score. It was a very difficult conversion attempt for Peter Hastie but he struck it beautifully and had the misfortune to see the ball hit the post, to leave the half-time score 10-5 to Belvedere. Naas were the better side in the second-half and may rue turning down a couple of shots at goals early in this period as scores were very hard to come by. A sublime break by Peter Hastie nearly led to one after 53 minutes, but the home side did reduce the margin after 67 minutes. Paulie Tolofua took a quick tap penalty but was hauled down immediately by Eddie Rossiter. This led to the Belvedere player receiving a yellow card and an easy penalty chance for Peter Hastie which he made no mistake with. The home side threw everything into the last ten minutes to salvage the game and they came very close. At times the Belevdere defence was stretched to almost breaking point but somehow they survived, athough Naas did have a chance to win it with the very last kick of the game. 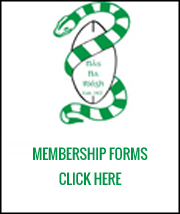 Following a ruck Naas were awarded a penalty some 55 yards out. It was a difficult chance but Cillian Dempsey struck it well, however it drifted slighty left and narrowly missed the target. The final whistle blew straight away and Naas were condemned to their fourth successive defeat. However despite this they are only two points behind the leaders St. Mary’s College in the league table. This is some achievement when you consider the amount of injuries they have amasseed in recent weeks. They now have a break of five weeks before their next outing when they again face Old Belvedere. Hopefully by then their long injury list will be shortened and they can get back to winning ways. 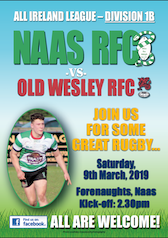 Naas: Fionn Carr, Rory Cleary, Jordan Fitzpatrick, Johne Murphy, Ben O’Connor, Peter Hastie, Richard Fahy, Jordan Duggan, Graham Reynolds, Conor Doyle, Paul Monahan, David Benn, Ryan Casey, Will O’Brien, Paulie Tolofua. Replacements:Cathal Duff, Adam Coyle, Cillian Dempsey, Pierce Dargan, Max Whittingham. Old Belvedere: Danny Riordan, Jack Keating, Tom Molony, Jamie McAleese, Fergus Flood, Steve Crosbie, Paraic Cagney, James Bollard, Eddie Rossiter, Roman Salanoa, Jack Kelly, Eoin Sweeney, Colin Mallon, Eoin O’Neill, Tom De Jongh.Replacements:John McKee, Adam Howard, Conor Owende, Ben Carty, Peter Maher.